The Nuby 100% Natural Cotton Muslin Teething Bib is ideal when babies are drooling and teething. 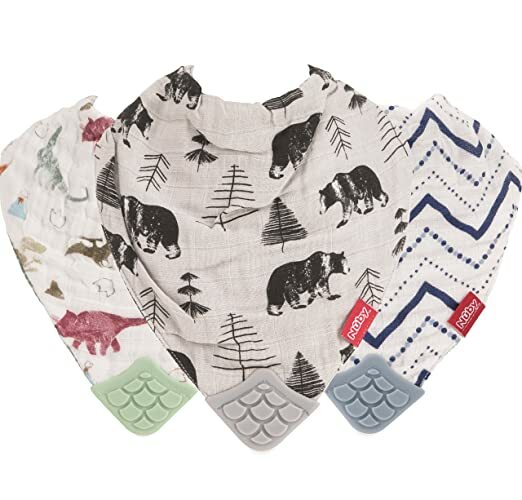 The lightweight woven pattern provides extra gentleness and the natural fibers are ideal for baby's sensitive skin. The bib stays secure with Velcro fastening to hold it in place. Plus the bibs feature a teething corner, with multiple textured surfaces, to chew on as new teeth break through. CARE INSTRUCTIONS: Wash before initial use and after each subsequent use. Machine wash warm, gentle cycle. Do not use bleach. Tumble dry low setting. Do not iron.